The newly released 2014 GMC Sierra and Chevrolet Silverado come with a new option that combines power and fuel efficiency. Both pickup trucks are available with the new 6.2-liter V8 EcoTec3 engine. The new motor has been given a highway rating of 21 mpg. The two wheel drive versions of both pickups trucks received ratings from the EPA of 21 mpg on the highway and 15 mpg in the city. The four wheel drive version of these same tow pickup trucks received ratings of 20 mpg on the highway and 14 mpg in the city. The full economy estimates for the new 6.2-liter V8 EcoTec3 engine is only 2 to 4 mpg less than the ratings for the two other motor option consumers can choose for those pickups. The 6.2-liter V8 EcoTec3 engine comes with an SAE certified 420 horsepower, 460 foot pounds of torque, which is the most torque and power for any of any light weight pickup motor. A GM spokesperson has pointed out that the towing and power capabilities is the fundamental attraction to a full size pickup truck. With that being said, he goes on to explain that the GMC Sierra and Chevrolet Silverado now have the ability to provide consumers unmatched towing capabilities and power. The V-8 option in the 2014 Silverado 1500 sets GM far ahead of the competition as being the most powerful of all the V-8 gas engines currently being offered by any automaker. The 6.2-liter V8 EcoTec3 engine comes with direct fuel injection, variable valve timing and cylinder deactivation. The 6.2-liter V8 EcoTec3 engine utilizes a compact overhead valve design. To help reduce the weight of the vehicle and improve energy savings, the engine utilizes aluminum cylinder heads and blocks. GM continues to stay in the forefront of the competition by providing their consumers with the option to purchase the strongest motor, yet focusing on making that motor lighter and fuel efficient. 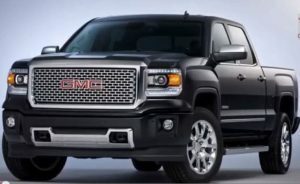 The 2014 GMC Sierra and Chevrolet Silverado recently went on sale hosting a bunch of newer technologies designed to attract more consumers and continue to keep GM in the forefront of innovation when it comes to engine efficiency. The Chevrolet Silverado continues to be the most important of all the pickup trucks for the Detroit automaker. The Chevrolet Silverado continues to be one of the best selling pickup trucks in the United States and the new 6.2-liter V8 EcoTec3 engine will only add to that appeal.